The waka on which the TSO sector with its many faces (nga matatini) carries community expectations and truths with integrity. Third Sector Organisations (TSOs) that are committed to the One Voice Te Reo Kotahi (OVTRK) kaupapa can put themselves on the OVTRK register. There are currently 120 TSOs on that Register. We support and promote the contribution of organisations in the sector. Many of these are city-wide TSOs (several with national dimensions). We have developed a Communication protocol and these are the Ideals upheld. We are independent and provide opportunities for the voices of TSOs to be heard. 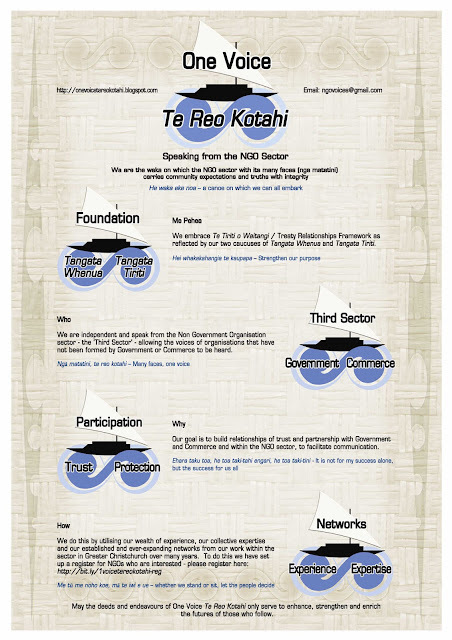 We stand, as tangata whenua and tangata Tiriti, providing expertise, experience of and in the Third Sector. People involved in TSOs on the OVTRK register can serve on the Organising Group (OG). OVTRK was established in 2011 as a non-profit (Third) Sector voice. For some the focus was on the Recovery from the earthquakes, for others on the desire for a more cohesive Sector. A broad range of Third Sector Organisations (TSOs) including those involved in the sport, culture, economic, environmental and social well-being have put themselves on the OVTRK Register. In July 2015 we approached the Urban Development Strategy Implementation Committee (UDSIC) and were pleased that the UDSIC responded positively. We then responded to the Draft CCC Resilience Assessment and in November 2015 were informed that it has been agreed that the UDSIC Refresh and the Resilience Assessment processes have become integrated. Our NGO Networking Party - 25 November 2015 was attended by representative of four of the five statutory partners in the UDSIC (CCC, Waimakariri DC, Selwyn DC and ECan with apologies received from Te Runanga o Ngai Tahu. We spoke to our submission on the Greater Christchurch Regeneration Bill in December 2015 and were then informed that UDSIC was working on establishing an enduring forum - so OVTRK advocated for TSOs to be recognised alongside the Government and Commercial Sectors in this enduring forum. In July 2016 we organised an Open Forum - Celebrating Matariki and the Voices of the Third Sector which considered the CERA research on our Sector that was develped by Chrys Horn (et al) - full Report here - in order to create positive plans for the future. The focus was on the priorities on pages 29&30. Sector Report & Actions are being followed up.